Various packages exist for supporting Scheme programming with the emacs editor. Geiser is a Scheme mode that provides eldoc (modeline signatures and symbol evaluation), auto-complete and company-mode support, documentation search, et al. Chicken support for Geiser is near-complete and recommended for use. Geiser is available on MELPA and via Git. 1. Install the necessary support eggs. For Chicken 5, you’ll also need SRFI-18. 2. Update the Chicken documentation database. Particularly recommended is Alex Shinn's scheme-complete, which provides intelligent autocompletion. dans-custom-emacs provides a set of extensions that enable full offline auto-complete w/ chicken-doc integration, complete font-lock support including prefixed modules, and support for all presently installed chicken modules. Recommended for those who find themselves coding without a reliable REPL. paredit provides structural editing for Scheme and Lisp code. Neil van Dyke's Quack enhances Emacs support for Scheme and can be used for editing CHICKEN code. 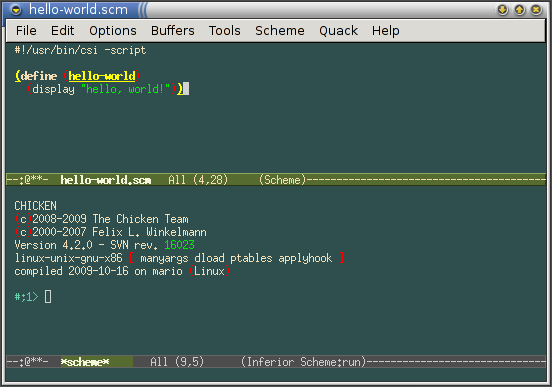 The screenshot above shows GNU Emacs using Quack to edit a "hello world" program and the CHICKEN REPL being executed from within Emacs. The -:c is to force interactive mode, which is required on some platforms (most notably Windows). This variable is customizable, which is the preferred way in GNU Emacs and XEmacs to set user preferences: menu Options -> Customize Emacs -> Specific Option, type in scheme-program-name. Emacs displays a form; fill in csi -:c for the program name, click "Set for Current Session", and then "Save for Future Sessions". This will update (or create if it does not already exist) the custom-set-variables section in your ~/.emacs file. (comint-send-string (scheme-proc) (concat "(load \""
(comint-send-string (scheme-proc) (concat "(compile-file \""
See also the writing portable scripts page. Dan Leslie wrote emacs-multi-mode for easy switching between scheme-mode and c-mode.